There is another reasoning which leads to the same conclusion. At the detector has zero sensitivity. For this reason, in case of null observation, this values gets the maximum degree of belief. 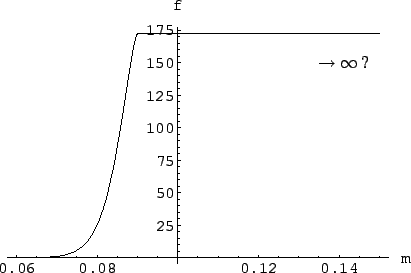 As far as larger values are concerned, the odds ratios with respect to must be invariant, since they are not influenced by the experimental observations, i.e. 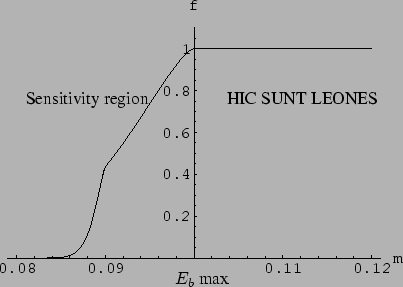 Figure: Result of the inference from experiment , taking into account values of mass above the beam energy as well. These all have the same degree of belief and the normalization constant depends on the maximum value of considered. Therefore the distribution is usually improper. decreases (i.e. we tend to believe more strongly large mass values) but its exact value is not well defined. For this reason we leave the function `open' on the right side and unnormalized. The normalization will be done when we can include other data which can provide an upper limit.